MAY 1999: An ongoing strike by medical doctors in Israel has put a severe economic strain on the funeral business in that country. The dramatic decline in the death rate is prompting the burial association to ask the Government to approve an increase in doctors’ pay. According to the newspaper The Jerusalem Sun, death rates have dropped considerably in the past three months in most of the country since physicians in public hospitals implemented a program of sanctions, according to a survey of burial societies. Meir Adler, manager of the Shamgar Funeral Parlour, which buries most other residents of Jerusalem, declared with much more certainty, “There definitely is a connection between the doctors’ sanctions and fewer deaths. We saw the same thing in 1983 [when the Israel Medical Association applied sanctions for four and a half months].” Sources tell this author that the same phenomenon occurred in British Columbia during a doctor’s strike in Canada (Lancet Article: http://www.bmj.com/cgi/content/full/320/7249/1561). Medicine, impersonating science, has co-opted the word “proof” to provide comfort to the gullible; and in so doing it has tarnished the reputations of science as well as of medicine. When the medical profession pretends that there is such a thing as scientific proof, labeling their remedies as proven and decrying unproven alternatives, it seems unaware that in physical science there are only guesses, hypotheses, theories and few laws. Only repeatable experiments determine truth. To the degree that medicine relies on carefully conducted experiments and collects data without preconceived notions, which can be duplicated and criticized by other scientists, it follows generally accepted scientific principles. Conclusions may be drawn, but to imply that there are proven methods for controlling disease, is to lie. The problem with a medical system based upon “proof” is that, over time, people discover that unproven remedies work and so-called proven remedies may not. The common cold is a good example. Millions have discovered that there is a simple “cure” for the common cold, before the virus takes hold. The public may not be able to verify for themselves whether or not medical “science” is right about the likes of heart disease and cancer, but thanks to Linus Pauling, many have discovered that it is easy to stop the cold virus in its tracks. The public is becoming increasingly aware that something is rotten in the state of medicine. Generally, doctors are well educated in the arts that do not directly compete with prescription drugs, e.g., diagnosis, surgery and trauma treatment. Regrettably, doctors receive little or no training in non-prescription substances, which are ignored by medical authorities as unproven. When proven remedies fail, and unproven remedies easily succeed, the reputation of all scientists is unfairly harmed. Doctors take lives into their hands, and people want to believe that medical care is infallible; despite all evidence to the contrary. We wish to believe that science has proven remedies. It isn’t pleasant to hear drug company senior executives tell the world that clinical trials are “generally useless,” and that most drugs do not work on most people as advertised. Nor is it pleasant to learn that many common medical procedures were never “proven” before becoming adopted and generally accepted by the medical profession. 1. Cholesterol is the enemy. 2. Medicine/Cardiology is based upon strict science. 3. Medical Doctors, cardiologists and pharmaceutical companies always behave in the patient’s best interest. The problem is that doctors graduate from medical schools convinced that there is little or no proven therapeutic value to anything other than “scientifically tested” prescription drugs. Why is it that such bright people, skeptical about almost everything, are not skeptical about the claims made for the drugs they push? Are deliberate prevaricators in control of medicine and medical curricula? One thing is clear; orthodox medical doctors do not offer better, more effective, safer and cheaper options for treating chronic disease because they lack that particular training and appear to have little respect for the value of “unproven” antioxidant, vitamin, mineral, amino acid, and enzyme supplementation. Any “conspiracy theory” implies that it has been possible to deceive an entire profession, and to brainwash the public, simply by the frequent use of the word “science.” There are the ‘Quackbusters,’ who work to discredit alternatives to prescription drugs; including those who advocate such alternatives. (It is difficult to believe that the ‘Quackbusters’ influence medical classrooms and texts). It hardly seems likely that medical education could be so tightly controlled, that all doctors are cut from the same mold. In any case, the nutrition-vacuum in orthodox medical education is pervasive, serving more than one master. The legal right to prescribe drugs, after all, is what separates MDs from chiropractors and other physicians. Whatever the reason, medical students truly believe that their education is based upon the pursuit of truth. However, the author has observed the mind-control techniques used in medical schools, most notably during classes on nutrition. These techniques are often adopted and used by medical authorities and writers in the media. The first technique is to present any benefit of any non-prescription substance in a way that casts doubt upon its value. Authorities use the words “may” or “might” in conjunction with any nonprescription substance and a therapeutic value. The positive clinical responses to drugs are rarely qualified, leading to a biased and highly distorted view of the medical universe. In an early nutrition class, there was a checklist on quacks included with the course materials. This material implied that anyone who prescribed more than the 10-times the Recommended Daily Allowance (RDA) of a vitamin was, by definition, a quack. However, vitamin C may be a poor example. The reason for taking another class was to learn ‘therapeutic nutrition’, however, vitamin C was not mentioned once during the entire semester! Another common technique is to imply that large, extended and expensive studies are required before a medical finding becomes is ‘proven.’ Medical students are told repeatedly that pharmaceutical medications are products of extensive research, and that only such findings should be trusted. For a detailed account of how far medical “science” has veered off track, see the Hickey/Roberts book Tarnished Gold: The Sickness of Evidence-based Medicine. For example, small studies can notice a large effect. Large studies are required to notice small effects. Again, even suggesting to medical students that anything can be “proven” in science is a lie to begin with; but this is what is taught. This conditioning by medical authority figures during their schooling builds confidence in prescription drugs and reinforces the idea that medical education is scientifically based, and that the science of nutrition is second-rate or even fraudulent. To the medical student, remarkable claims for vitamins and antioxidants seem fantastic and are easily dismissed and curiosity, fundamental to good science, is suppressed. It is ironic that medical doctors consider themselves firmly grounded in science, and are generally looked upon as authorities in the field of human health. These techniques work because no one wants to believe: a) medical students are being brainwashed (certainly not those misinformed medical students), b) new graduates are incompetent, or c) pharmaceutical companies would promulgate known untruths regarding matters so fundamental to human life and health. This unfair treatment; the absurd force-feeding of ‘selected’ information surrounding nutrition science, the main competitor to prescription drugs, occurs in medical schools presently, and an enormous amount of dangerous legal drugs are sold as the result. This deliberate withholding of beneficial information has harmed all human beings. Most people believe it reasonable to think that science has failed, in that the cures for cancer and heart disease are unknown. There are a growing number of concerned scientists who question the claims being made regarding pharmaceuticals, which generally treat rather than cure disease. This skepticism of the interpretations of medical science used to sell drugs is bolstered from the observance that truth in prescription drug advertising would irreversibly erode sales. The dilemma facing pharmaceutical executives is real. They are forced to lie rather than telling the truth, as the truth would most likely lead them to go out of business. Medical doctors, conditioned to accept pharmaceuticals as products of rigorous science, have become pawns of the pharmaceutical companies. Doctors that legitimize the marketing and sale of ineffective and dangerous prescription drugs, perhaps unknowingly, cause injury and death of millions. The popular antacid drugs, which block the formation of stomach acid, are an example of prescription drugs that may cause harm. Could the evolution of human beings be so imperfect that we require a drastic reduction or elimination of stomach acid? Drugs such as Prilosec® and Nexium® earn their makers $20 billion. These “nuclear” acid-blockers cause additional health problems by interfering with normal digestion, problems that few would connect to the antacids. Research has substantiated the finding that antacids interfere with digestion, cause poor nutrient absorption, and interfere with the “acid barrier” that keeps lower tract bacteria in the lower tract. Jonathan Wright, MD, claims that acid-blocking drugs lead to increased rates of infection, nutrient deficiencies and possibly blindness in his book Why Stomach Acid Is Good for You: Natural Relief from Heartburn, Indigestion, Reflux and GERD (Jonathan Wright with Lane Lenard). Whether intentional or not, poor absorption of minerals and other vital nutrients caused by the use of antacids creates another $20 billion market, the antidepressant prescription drug market. For example, low stomach acid leads to poor vitamin B12 absorption. When vitamin B12 is not absorbed, depression is often the result. The most dangerous hoax has been the “statin” cholesterol-lowering drugs. These drugs are sold to more than 25 million people worldwide, earning their makers more than $20 billion dollars annually. Touted as “life saving,” statin drugs can actually cause heart disease. These drugs weaken muscle, leading to heart failure; and at high enough dosages without antioxidant support, could lead to a need for heart transplant. These drugs are the wrong prescription for anyone, much less heart patients. U.S. doctors are not warned that artificial HMG-CoA reductase inhibitors (statins) also inhibit the synthesis of coenzyme-Q10. With high statin dosages, serum levels of CoQ10 inevitably decline, which causes muscle myopathy in many patients. The Merck pharmaceutical company, which sells Zocor®, has several 1990 U.S. patents protecting the means to correct this serious problem. Canadian advertisements for Lipitor® and Zocor® contain a warning about CoQ10 depletion, however these warnings are noticeably absent in the United States’ advertisements. Most medical doctors do not know what coenzyme Q10 is, so they don’t know of its great importance in cardiovascular health. It is known that the millions of statin users and their doctors are unaware that ascorbic acid (vitamin C) is important in the regulation of endogenous cholesterol synthesis in humans. It has been known since 1986 that this vitamin, like the statin drugs, block the same HMG-CoA enzyme that is required for the body to mass-produce cholesterol. Vitamin C deficiency induces the body to produce more cholesterol. 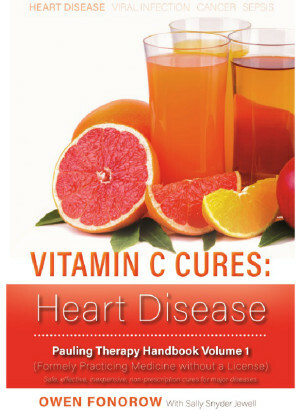 In 1992, the world’s only twice-unshared Nobel Prize winner, Linus Pauling, made a video where he has stated, “heart disease is a chronic vitamin C deficiency.” Pauling’s thesis is compelling and supported by conclusive laboratory experiments. His brilliant, patented, nonprescription cure for cardiovascular disease is readily available to the public. It is difficult for reasonable people, especially medical doctors conditioned to believe that prescription drugs are well researched, to believe that pharmaceutical companies would hide the truth about matters of life and death, or that the FDA would stand by and permit it. It is common sense to question the need for lowering cholesterol. As the human species evolved to produce cholesterol in large quantities, why does the liver make more cholesterol as the intake declines? If these statin drugs are so beneficial, why is cardiovascular disease still the leading cause of death in the United States, and why do the authors and researchers of the most recent statin studies keep their raw mortality data secret? If one stops and considers these findings, he/she may realize that artificial cholesterol lowering, by itself, is unlikely to improve health or increase their longevity. Studies have shown that these statin drugs, as is the case with many prescription drugs, do more harm than good. Better results occur with concurrent antioxidant usage, but this knowledge is deliberately kept clouded. Statin cholesterol lowering drugs are products of the best science money can buy. They seem to have been designed to create an even larger market for medical care. Their marketing, which doctors fail to question, contains distortions, half-truths, and deceit. LOS ANGELES, 2000: Mark Hughes, the 44-year-old founder of Herbalife International Inc. was found dead in his bed May 21. He died from a combination of alcohol and the prescription anti-depressant Doxepin (Reuters). How can we protect our children from the new wave of prescription drug advertisements on television? According to the American Medical Association, adverse reactions to prescription and over-the-counter pharmaceuticals are a leading cause of death and injury in the United States. The massive propaganda ad campaign on TV teaches everyone, especially kids, that drug use is okay. No wonder so many kids think it is okay to use illegal drugs! How are they supposed to tell the difference? As of this writing, there is a doctor’s strike in Israel. The death rate has fallen so sharply during the strike that the Israeli funeral parlors and burial societies are complaining. One of the reasons the Japanese live so long is that prescription drugs are considered a last resort in Japan. Prescription drugs are dangerous and extremely hazardous to one’s health. Children watching television in the United States are being trained to think otherwise. In the absurd dreamland of a TV prescription drug commercial, there is a pill for every ill. Parents may laugh at the side effects, but it all becomes normal to a child. Where is the D-chip to protect our children from “ethical” drug ads? If the truth was known, our children would be asking us how and why drug companies are allowed to sell cholesterol-lowering drugs that at normal dosages cause cancer in laboratory mice. Not all pills are created equal. Recently, the U. S. National Academy of Sciences announced that it has increased what used to be called the Recommended Daily Allowance (RDA) of vitamin C and vitamin E. While this seemed to be good news on the surface, the council spoke with a forked tongue. These meager RDA increases were announced in an alarming press release. The council wrote that the mounting evidence for higher antioxidant vitamins is “flimsy.” Taking high amounts of antioxidants might be harmful, or so the council claimed; ignoring a mountain of recent evidence to the contrary. The National Science Council’s reasoning is why we as laymen get lost trying to follow medical thinking. As far as anyone knows, there hasn’t been a single death caused by an overdose of either vitamin C or vitamin E. For that matter, one can find no evidence that any person has ever died taking too much of any vitamin or amino acid. It is now reasonably well documented that the vast majority of “ill effects” comes from taking too little of these and other vitamins. However, all dangers increase while taking prescription drugs. When the medical profession acts like a business, it cautions us about taking antioxidants, while pushing dangerous prescription drugs down our throats. Is population control the hidden agenda? A recent study by Dr. Bruce H. Pomeranz, the principal investigator and neuroscience professor at the University of Toronto, sheds light on this phenomenon. Dr. Pomeranz estimated that bad reactions to prescription and over-the-counter medicines kill more than 100,000 (76,000 to 137,000) Americans and seriously injure an additional 2.1 million every year. Such reactions, which do not include prescribing errors or drug abuse, rank between fourth and sixth among causes of death. His study was published in the April 15, 1998 Journal of the American Medical Association (JAMA), but garnered little publicity. One month later, the same American Medical Association explained why Americans are following the Japanese lead and have turned in massive numbers to the so-called Alternative Medicine. The surprising answer? People think it works better! The surprising study appeared in the May 20, 1998 JAMA entitled WHY PATIENTS USE ALTERNATIVE MEDICINE (p. 1548-1553). Stanford researchers, on the basis of a National study, estimate that Americans made 425 million visits to alternative health care providers in 1990, a figure that exceeded the number of visits to allopathic primary care physicians during the same period by almost 100 million visits! 47% of these physicians also reported using alternative therapies themselves, while 23% incorporated them into their practices. The reasons people gave for using Alternative Medicine are surprising. According to the JAMA article, the two most frequently endorsed benefits are, “I get relief for my symptoms, the pain or discomfort is less or goes away, I feel better,” and “The treatment works better for my particular health problem than standard medicine’s.” According to the study author, these responses were unexpected and suggest that the most influential or salient factor in people’s decision to use alternative health care may be its perceived efficacy. One may ask, where’s the catch? Drugs kill. Vitamins, amino acids, herbs and minerals are not only safe, easy to obtain, and far less expensive than prescription drugs; they also seem to promote health and make many pharmaceuticals unnecessary. The clinical experience of medical doctors, e.g., Robert C. Atkins in his recent book VITA- NUTRIENT SOLUTION, confirms the Stanford survey. Many vitamins, minerals, herbs, amino acids and various other non-toxic vital substances are more therapeutically effective at high dosages than their dangerous drug counterparts! COMPARATIVE CAUSES OF DEATH. ANNUAL AVERAGE IN THE U. S.
We now know why the pharmaceutical industry feels compelled to spend massive money on drug advertising aimed at our children. The future survival of these two industries, funeral parlors and pharmaceuticals. are at stake! The Tenet Healthcare Corporation agreed yesterday to pay $54 million to resolve government accusations that doctors at a hospital in Northern California conducted unnecessary heart procedures and operations on hundreds of patients. The settlement is the largest in a case involving what is known as medical necessity fraud, or billing government health programs for tests and treatments that the patient’s condition did not require. The settlement pre-empts any civil and criminal charges by the Justice Department against Tenet, its hospital division and the hospital itself, which did not admit wrongdoing. Nevertheless, in settling, Tenet signaled it would rather pay a record fine than argue in court that there was a medical reason for the patients to undergo the procedures or operations. Under the agreement, the Department of Health and Human Services is allowed to continue its own inquiry to determine whether Tenet and its hospitals should be barred from federal health programs, including Medicare. Criminal and civil investigations of individuals are continuing. Moreover, former patients can proceed with their lawsuits against Tenet, the hospital and the doctors. Who dominates the truth, and dominates the internet market.